What is your attitude toward the Bible? Many Christians openly state that they “love” the Word of God. They will make all sorts of statements about how the Bible affects their lives. They will post on Facebook how the U.S. need to return to the Word of God. But I can’t help but wonder how many people are actually engaged with the Bible on a daily or even weekly basis. I find it encouraging that Barna Research has determined that Millennials who practice Christianity (defined as attending a church at least once per month and consider their faith important to their life) have a high regard for the Bible. Peter demonstrated his high regard for the Word of God. In 1 Peter 1:23-25, Peter stated in very strong terms his believe in the eternality of the Word God. Peter then deals with the place of the Word of God in the life of the believer. Peter lists five attitudes and acts that believers need to reject. We need to reject malice: Christians should reject all kinds of evil conduct and moral evil in all forms. This includes our rejection the evil brought on by our culture. I immediately think of abortion. This to me is a great evil that has destroyed over 58 million lives since 1973. Christians must reject this form of wickedness. We need to reject deceit. Christians should reject guile, generally presented as cunning and craftiness. This an attribute of the false teachers Peter speaks against in his second epistle. False teachers use a hook to lure people into their folds…but the hook is based on a lie (Peter calls it heresy). We need to reject hypocrisy. Christians should not be involved in forms of false pretenses. Hypocrisy has its roots in drama. When an actor takes on a character in a play, he is pretending to be someone he is not. Many in the Church present themselves in false way in the Church. Many put on their Sunday face when in church, but are very much of the world during the week. This is hypocrisy and has not place in the Christian faith. We need to reject envy. Envies are the feelings of displeasure we have when we hear of the blessing or prosperity of others. This is really the opposite of love. We are to love one another—we are to hope for the very best of others. Envy is the feeling of almost hatred when we hear something good about a brother or sister in the Lord. Peter says that we need to reject or lay aside these five attributes that are almost second nature to us. Instead, Peter says we need to turn to the Word of God. Peter gives us a command…this is not something we should consider. Peter demands that Christians “…desire the pure milk of the word, that you may grow thereby…” (1 Peter 2:2) The only way of “laying aside” the negative attributes is to desire the Word of God. Our desire should be like that of a baby who desires milk. New believers (and even those who have been growing in the Word for many years) require the Word in their lives. This is always true. Spiritual growth occurs only when the Christian desires and receives the pure milk of the Word. The milk in this passage represents the basics of the Word of God. It is necessary for spiritual growth to happen. The purpose of the believer’s spiritual growth is to move toward sanctification—to move toward our future salvation in all of its fullness. Only by feeding on the Word of God can a Christian reach the spiritual maturity desired by God and then to partake of the meat of God’s Word. The writer of Hebrews demonstrates that not everyone moves on to maturity. When I first became a Christian, I had an insatiable hunger for the Bible. I read it and memorized it almost nonstop. At that time, I was presented with an aid to help me get the Word of God into my life. The illustration (presented above) is called the Hand Illustration (TM The Navigators). It presents five very important methods for learning from the Bible. We must all put these into practice in our lives. Some will be done daily, some weekly, and some perhaps monthly…but all of them must be present in our lives if we are to grow in our Christian maturity. Hearing: Romans 10:17—So then faith comes by hearing, and hearing by the word of God. Hearing the Word from godly pastors andteachers provides insight into others’ studyof the Scriptures as well as stimulatingyour own appetite for the Word. Reading: Revelation 1:3—Blessed is he who reads and those who hear the words of this prophecy, and keep those things which are written in it; for the time is near. Reading the Bible gives an overall pictureof God’s Word. 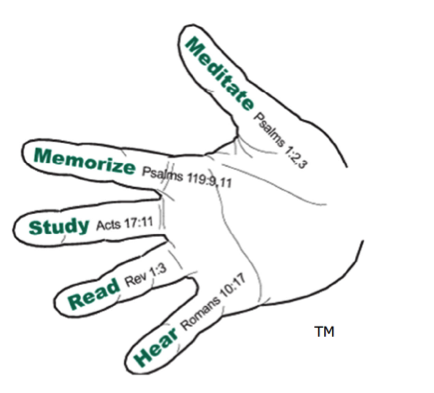 Many people find it helpfulto use a daily reading program whichtakes them systematically through theBible. Studying: Acts 17:11—These were more fair-minded than those in Thessalonica, in that they received the word with all readiness, and searched the Scriptures daily to find out whether these things were so. Studying the Scriptures leads to personal discoveries of God’s truths. Writing down thesediscoveries helps you organize and remember them. Memorizing: Psalm 119:9, 11— How can a young man cleanse his way? By taking heed according to Your word. Your word I have hidden in my heart, That I might not sin against You. Meditating: Psalm 1:2-3—But his delight is in the law of the Lord, And in His law he meditates day and night. He shall be like a tree Planted by the rivers of water, That brings forth its fruit in its season, Whose leaf also shall not wither; And whatever he does shall prosper. Meditation is the thumb of the Word Hand, for it is used in conjunction with each of theother methods. Only as you meditate on God’s Word–thinking of its meaning andapplication in your life–will youdiscover its transforming power at work within you. How are you doing in your pilgrimage toward spiritual maturity? Are you applying these five methods to intake the word of God into your life? If you need help, please contact someone whom you know can help you. 2 Replies to "Long for the Word"
Great reminder Jon. 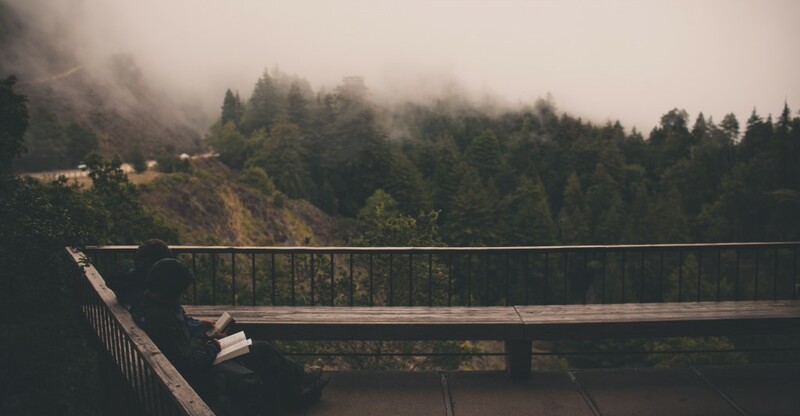 I was convicted on how important it is to memorize Scripture and how I have gotten away from that for the most part over the past year or so and have always been very sporadic at best with it. I conveniently have a long written out list of very important Scripture to go over on a daily basis and keep memorized (much of what I got from Navigator booklets). It is conveniently at arms length by my lazy boy chair in living room and I have become too “lazy” to even look at it any more.